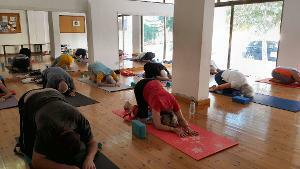 Please see my yoga class schedule for spring/summer 2019 in Polis below. If you are new to yoga or haven't been for some time, please contact me to let me know you are coming, so I can be sure there is enough space for you and that I have enough mats if you need one. Plus also in case I need to change a class time or venue at the last minute. If you are not sure about attending a group class or would like a personalised yoga session instead, please contact me about booking a private class. I also offer private yoga therapy sessions for those with injuries, aches and pains or other ailments - no previous experience of yoga required. 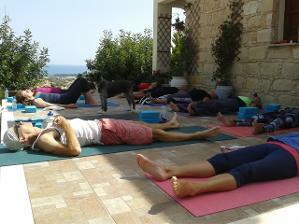 If you are a group here on holiday or perhaps here for a wedding in Cyprus, let me help you unwind with a private group class at your villa or hotel. 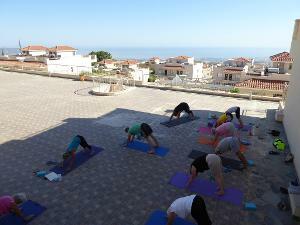 Group classes end Oct-mid May are held INDOORS* in Polis. See below for directions to the studio. There is plenty of space at the studio, but if you are coming for the first time, please let me know if you need a mat. 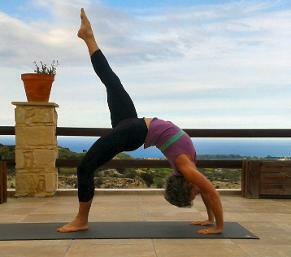 Please e-mail me at helen@not-just-yoga.com or call me on +357 99350898 if you have any questions. *From end October to approx mid May, classes are held INDOORS at the Yoga Den aka the Tae Kwon Do Studio. Find the studio behind the former Flo Cafe (now the Russian Mix supermarket). After the big church, drive past St Andrews Plaza and past the Marion Hotel and turn immediately LEFT after the hotel. Take the next RIGHT and the studio is the first building on your right. It is a residential street, so please park in the old Orphanides car park 50m further on and walk back. Please check my Facebook page for additional information.